Coming into Venezuela from Brazil (the south) the first region you get to is called Gran Sabana. It's quite spectacular and great for overlanding. We are about the pass our third night in the Gran Sabana. Each night we've free camped (pamped) just off the road with spectacular views. What makes the area so good is that it's open country at an altitude of about 1000metres (so cooler temperatures) with rolling hills of interesting vegetation with high plateaus occasionally striking up and out of the terrain. If your energetic it's worth climbing a plateau (actually they are called tepuis) but H and I are loving the views from the car window. As well as views there are a few indigenous villages scattered around. Yesterday as we passed through one of these villages an Indian (indigenous) woman came rushing out, waving frantically to us. We stopped. She came to my window and waited, 'Hola' I said, wondering why she wasn't starting the conversation. She asked (in Spanish), 'what are you selling?'. 'Oh', I replied, slightly amused, 'we aren't selling anything, this is a motorhome, a house-on-wheels'. The woman looked a little disappointed. 'Oh, so you don't have any bread?'. The woman looked thoughtful 'any salt?'. 'Yes, you're in luck', I said heading to kitchen. We still had plenty of salt from Hendriks failed patagonian salmon smoking project. For this he planned to catch a lot of salmon, and smoke them. He'd bought a lot of sugar, and salt, and acquired timber from fruit trees. Then he didn't catch any salmon! I gave away the sugar (it attracts ants), we tossed the wood, but we still had salt. So we gave the woman a bag of salt. 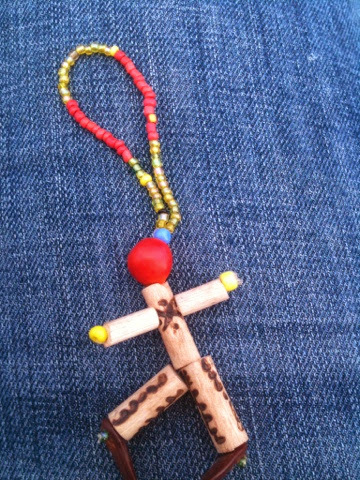 And, in return she gave us a cute little trinket (see below) which was so lovely because it was unexpected.